Trailer Launch Of Baaghi 2 Witnessed A Never Seen Before Fan Frenzy! Home BOLLYWOOD Trailer Launch Of Baaghi 2 Witnessed A Never Seen Before Fan Frenzy! The Baaghis were dressed in Black with ‘Baaghi 2’ written over the T-shirts, the rebels attended the event with a red bandana tied to their arms. The Baaghis present at the event created a hysteria as they cheered for the trailer. The loyal fans were seen rooting for the team of Baaghi 2 right from the time they landed from a chopper in Mumbai to the event wherein the trailer was launched. 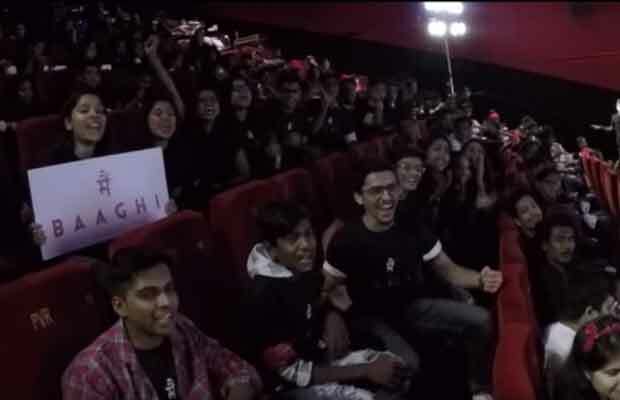 A total of 200 Baaghis proved their love for the actors Tiger Shroff and Disha Patani along with the filmmakers as they were seen applauding and cheering for the trailer. The trailer of Baaghi 2 has been loved across all platforms and it has already started rooting for the film. The sequel to the 2016’s Baaghi, Sajid Nadiadwala’s Baaghi 2 is turning out to be one of the most anticipated films of the year. While the sequel hasn’t even released yet, audience is already rooting for the third instalment. Baaghi 2 trailer showcases the return of Ronnie played by Tiger Shroff as he sets out to find a small girl called Riya. The film also features Disha Pattani in a lead role, Disha is playing the role of Neha who is the love interest of Ronnie in Baaghi 2. Baaghi 2 also has Manoj Bajpayee, Randeep Hooda and Prateik Babbar in pivotal roles. Previous articlePrabhas’ Magnum Opus Baahubali: The Conclusion Wins Hearts In Japan!